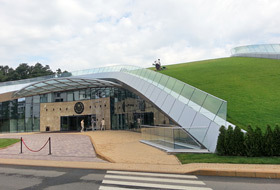 Pitched green roof with lawn using ZinCo Floraset® FS 75 as well as ZinCo Georaster®. Accessibility for maintenance is a prerequisite to grow lawn on pitched green roofs. Using ZinCo TSH support brackets and ZinCo TRP 140 eaves profiles provides a delicate looking but strong enough roof edge on pitched roofs. While the greening of flat roofs nowadays is very common and popular worldwide, with millions of square meters being installed every year, the greening of pitched roofs is still considered as an exceptional case. To be clear: Pitched green roofs — properly planned and executed – are durable and safe and offer as many benefits as flat green roofs do. They retain water and delay the run-off of excess water, they enhance sound and thermal insulation and they provide habitat for animals and plants. Shear forces have to be derived into stable eaves edges and additional shear barriers may have to be installed to prevent the green roof build-up from sliding; specialised drainage boards need to be used to help retain the soil substrate; substrate layers need to be increased and additional irrigation might be necessary; and last but not least the question of maintenance and the right selection of plants has to be taken into account right from the beginning. To meet these special requirements of pitched green roofs, professional planning and execution is essential and the use of special pitched green roof system build-ups is indispensable. As a base for a ZinCo system solution for pitched green roofs a root-resistant waterproofing membrane is required. On top of this, heavy duty water retention and protection mats are used to protect the waterproofing and provide sufficient water retention despite the roof slope. The core element of the ZinCo system build-up for roofs with a pitch of up to approx. 25° is the Floraset® FS 75 drainage element which due to its profiled design and studs facing upwards interlock well with the substrate layer preventing the substrate from sliding and at the same time distributing the shear forces safely in to the eaves upstands or into additional shear barriers. For steep pitched roofs with a pitch between 25° and 35° ZinCo offers a different build-up system solution using ZinCo Georaster® elements which can derive shear forces of up to approx. 800 kg/m. 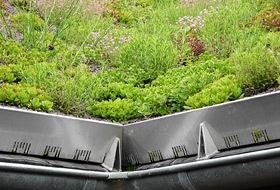 The shear forces on pitched green roofs depend upon the roof pitch, shear length and build-up height. They can either be distributed into the eaves upstand (although this may lead to extremely large constructions in the case of very high forces), or they can be transferred to the roof structure by using special ZinCo support brackets. These support brackets, used in combination with ZinCo slotted eaves profiles, allow for excess rain water to drain away unobstructed and at the same time provide a much more delicate looking but strong enough roof edge. In case of pitches over 20° this combination of support brackets and eaves profiles can also be installed as an additional shear barrier. Sedum plug plants or sedum mats are used as standard vegetation on pitched green roofs, however, meadow like vegetation with perennials or even lawn can be grown on pitched roofs if load bearing capacity allows and accessibility for regular maintenance is given. ZinCo has offered proven systems solutions for the greening of pitched roofs since 1990 and is able to give support in the planning of pitched green roofs from calculating loads to specifying number and location of support brackets and shear barriers required. So tell us about your project. We have got the experience to bring it to life. 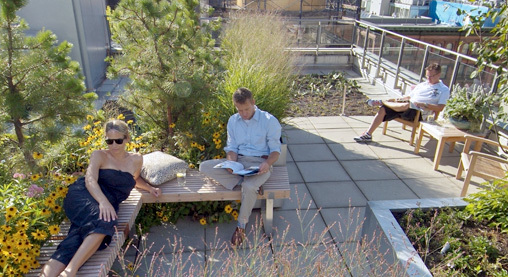 Author: Fabian Kaiser, ZinCo Green Roof Systems Ltd.